On Monday, weaker than expected factory data and continued concerns over emerging markets sent the Dow Jones Industrial Average nosediving 326 points to shave 2.08 percent off the Dow as the S&P 500 posted its worst loss (40.7 points) since June. 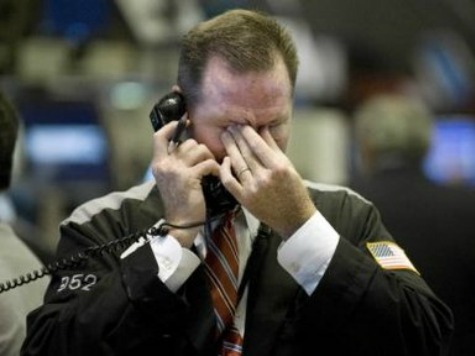 The selloff marked the seventh triple-digit drop in 2014 to put the Dow down 7.3 percent on the year. “The disappointing data provide further confirmation of a dramatic slowing in economic growth momentum,” TD Securities chief economist Millan Mulraine told Reuters. Some blamed bad weather. Others, like Morgan Stanley’s Ted Wieseman, were unconvinced. “It’s hard to believe that weather was the whole or even most of the story, but it’s not clear what else triggered the suddenly much slower growth these results point to,” said Wieseman. The dour market news comes on the heels of a treacherous January which saw Wall Street posting its worst month in over a year. “There has been a discernible change in behavior in the market from last year,” Cuttone & Co. senior vice president Keith Bliss told the Wall Street Journal. “You didn’t have to be real smart in 2013 to make money. You just didn’t want to get in the way of the Federal Reserve. The behavior change now is people are absolutely paying attention to fundamentals,” said Bliss.